The natural laws, things we take for granted on a daily basis, are things we haven't given much thought to. When we drop something, it falls. The end. We don't pull a Galileo and spend years dropping things of different masses and sizes to figure out why. But there are 10 quick and fun ways to SEE our natural laws in action, explained and de-mystified. Watch, and be amazed by how easily some of these simple experiments explain complex physics. Cool, right?! It looks like an optical illusion, but it's real. The way it works is that the center of gravity of any object is the point where you can balance the object as if all the masses were concentrated or gathered at this point. 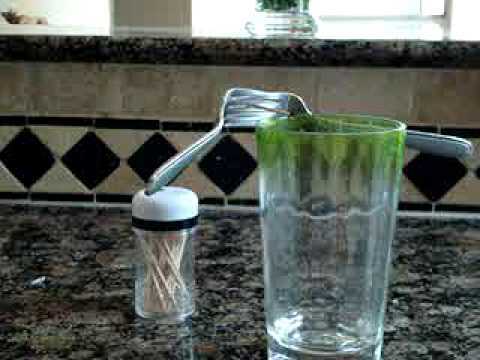 In this demonstration, the center of gravity is directly below the spot where the toothpick rests on the rim of the glass. It appears as if it is not using the glass to balance at all. Supersaturation is when a solution contains more of a dissolved material than could be dissolved by the solvent under normal circumstances. In other words, it simply can't dissolve any more. (It can also refer to a vapor of a compound that has a higher (partial) pressure than the vapor pressure of that compound. )For example, carbonation in a beverage is a supersaturated solution of carbon dioxide gas. 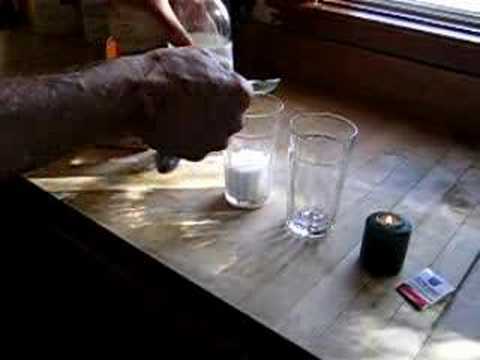 A Diet Coke and Mentos eruption is a rather extreme example of triggering the point at which the substance can take no more material to dissolve. 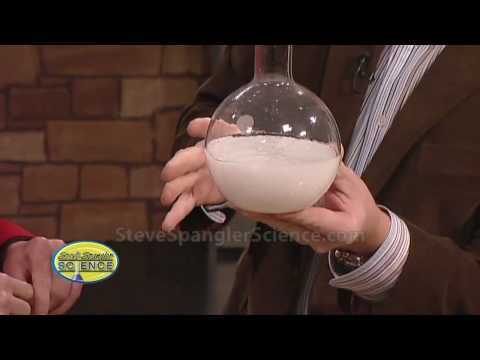 This experiment demonstrates the power of air pressure. Before it was boiled, the can was just full of air and water. But once the water boils it changes states from a liquid to a gas that you know as water vapor. This vapor pushes the air inside the can out into the atmosphere. 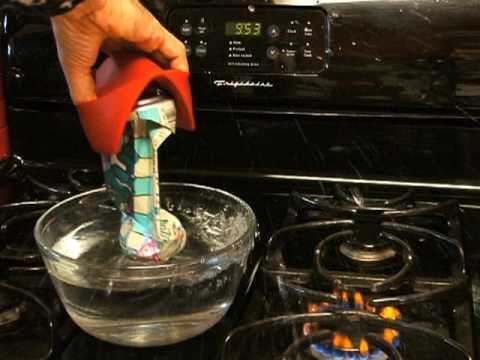 When the can was turned upside down and placed in the water, the water vapor condensed and turned back into the water. Water molecules in the liquid state are much denser than molecules in the gas state, so all of the water vapor that had previously filled up the inside of the can turned into only a drop or two of liquid, which took up much less space. This creates a vaccuum inside the can allowing the pressure of the air pushing from the outside of the can to crush it. The sudden collapsing of an object toward its center is called an implosion. Nature wants things to be in a state of equilibrium or balance. To make the internal pressure of the can balance with the external pressure on the can, the can implodes. CO2 has one carbon atom and two oxygen atoms, and a molecular weight of 44 grams per mole ( a certain number of molecules). Oxygen has a molecular weight of 32. Hence, carbon dioxide has a higher density, or is heavier than oxygen. This is why CO2 can be dangerous... it can displace the oxygen in a room and lead to asphyxiation.